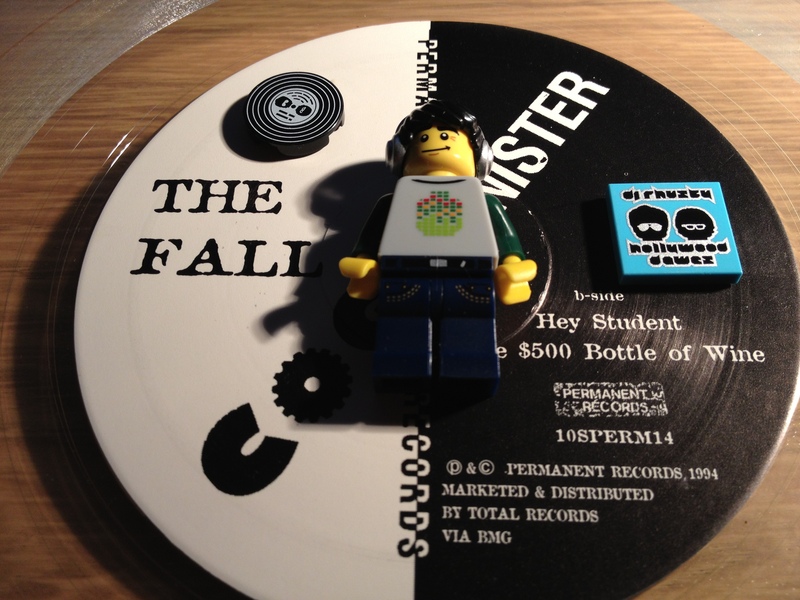 Here’s one to separate the men from the boys*, The Fall. 35 years plus of wilfull, semi-avant garde, truculent toying with the English language and counting, there are huge tranches of their work that veer from the unlistenable to the incredible, often within the same LP, or at times even within the same song. The Fall are always a demanding band, sometimes rewarding, sometimes not, always changing styles, players and components. I have always wondered how much of an element of Emporer’s new Clothes there was about the Fall, in that they leave so much open to interpretation, hint at so much, that obsessive muso-nerds like me divine clever references and read far more into it all than is intended. Not a bad game to play at all if you can get away with it, there are people (men, let’s face it) out there with hundreds of Fall LPs and 12″s (I own about 4 altogether, I’ve only ever been a bit of a dabbler) and they are one of the few bands still going out there which you can legitimately talk about in terms of eras. I got into them briefly through John Peel’s endless championing of them, together with a friend I met at university from Manchester who had a major obsession going on. For the record considering they were such a wilfully ramshackle indie crew they didn’t half rock on occasion – check out their cover of The Sonic’s ‘Strychnine’ online if you don’t believe me. My favourite Fall era was between 1990 and 1994 and I have two perfect examples here, 15 Ways and The Dredger EP. The former gets to ride the fast elevator to my affections as it is a 10″ on clear vinyl (sighs lovingly), oh and there’s some music on it too. My favourite is the B-side, ‘Hey! student’ in which over a fast, thrilling, indie thrash Mark E Smith rants about students with ‘long hair down and sneakers on your feet / You listen to Pearl Jam in your room’, which amused me at the time since I assumed that students formed most of his customers – it’s a great example of his being able to rhyme any two words in the English language simply by adding ‘-ah’ to the end of every line. ’15 Ways’ is an amusing riff on women’s magazines and lyrically nods to Paul Simon of all people, whereas ‘The $500 bottle of Wine’ sees Mark E Smith moaning over a darker, more downbeat track. The Dredger EP is even better, a limited edition 4-track 12″ with a big poster of the band, which is 3/4 brilliant. To my mind The Fall have always been a particularly brilliant covers band (Victoria, Strychnine, Why are people grudgeful?, Lost in music) and here they best out a Northern-slanted indie-billy version of The Big Bopper’s ‘White Lightning’, Smith barely concealing his joy within his usual sarcastic delivery, it’s one of my favourite Fall moments. ‘Blood outta Stone’ and ‘Life Just Bounces’ are also top-notch Fall tunes, playful and pretty tuneful and also lyrically pretty straight-forward a good snapshot of The Fall at their typical best. ‘Zagreb’ on the other hand I just find too dense and obscure for my liking, like a lot of their album tracks it leaves me cold. Listening again to them now, I like these records but they do seem very much of a time and place to me. I liked The Fall because they were so contrary and difficult and now some of their stuff irritates me for exactly the same reasons, I suspect that with more limited listening time these days (long gone are the days I could listen and re-listen to an LP deciphering every obscure reference) I need easier kicks. Then again, maybe I’ve just lost too many brain cells along the way. * or the dames from the broads. To (dis-)prove my maturity: did you notice the number “10SPERM14”? I’m just wondering, what’s the 14 for? Will the answer embarrass me? Ha! I’ve been a bit loathe to Google ‘Sperm Fall’ … But I’m sure there’s a perfectly valid reason for the catalogue number! I’m a fan of The Fall’s early 80s output. From Grotesque(After The Gramme) clear up to Bend Sinister. Of all those albums Hex Enduction Hour is my favorite. First time I heard ‘Hip Priest’ I was hooked. Mark E. Smith is so curmudgeonly I can’t help but like him. I’ll have to give the later stuff a spin. I’m more of a Shift work / Infotainment Scam kinda guy. Most sane people seem to catch The Fall bus, stay on for a couple of stops then get off whilst they still can. You gotta admire the man though. It’s definitely a bus you only ride every once in a while. I discovered them much later in life, as opposed to when I was young and angry. Being old and disgruntled, surprisingly, you get similarly affected by Mr. Smith.